I arrived at Poipu Beach early in the morning. It was quiet and still. The early morning shadows were long, reaching out into the protected cove. Soon the shadows would grow short and the little cove would fill with small children. Then the question would become , do I put the children into the painting or capture the scene as it was early in the morning. Tranquility won out. 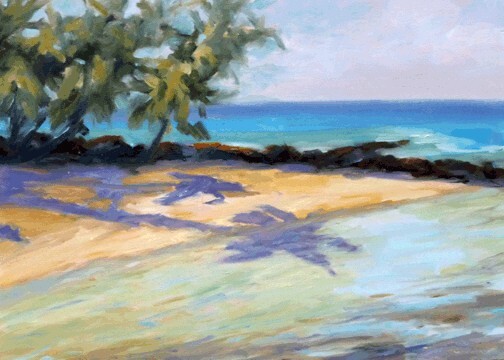 Poipu Beach has been named the number one beach in the world many times. It is the best beach I know of for little children. The cove is protected from the ocean’s waves by a volcanic rock wall. The water is clear, reflecting only the sky. You can see the sandy beach under the shallow water. The best part is I can walk to Poipu Beach from my home. This Painting is available. If you are interested shoot me an email.